I don’t know about where you live, but here in southeastern PA, winter has been extra rough. We haven’t really gotten a nice calm, sparkly snow yet. You know, the kind where the snow cover mutes the chatter of the world and throws every little sound outside into sharp relief against the hush. I’ve lived here all of my 37 years, and I can remember some monster blizzards, but I’ve never heard of a winter storm called a bomb cyclone (happening on the east coast right now). Howling winds with a chill below zero for days on end, ice on the *inside* of my windows, frozen water pipes, my goats and chickens hiding in their shelter (I even have a goat wearing coats in the greenhouse), extra super über dry skin, and waaaay to many layers of bulky, restrictive clothing. Everything just seems like it takes extra effort right now. I feel like I’m just surviving. By the time Imbolc comes around (celebrated February 1), I am more than ready to feel the quickening. I’m ready to smell mud after a snowmelt and feel the sun’s rays warm my cheeks between wind gusts. I’m ready to see snowdrops and hellebore. I’m ready to feel the roots and shoots under my feet being re-infused with life, reaching ever outward. I am notorious for starting to clean out my beds in February on the first day that feels reasonable enough to spend some time outside (my cold sensitivity belies my Scandinavian heritage). I almost cannot bear my craving for green and growing things any longer. To my ancestors, Imbolc (sometimes spelled Imbolg or referred to as Oimelc) heralded the first signs of spring. At first listen, the earth may seem still and silent, but there, underneath a cuticle of frost, is the timeless thrum that endures the turning of all seasons. It is the beating of an ancient, primal heart. The goddess Brigid, who is known by many names (Bride, Brighid, Brighde in Scots Gaelic, pronounced BRIDE, BREED, or BREE-juh), now takes over while the Cailleach (the maiden’s crone counterpart) retreats to her craggy home. Where the Cailleach is the queen of all things dark, wintry, and stormy, Brighde is the green goddess of spring rebirth. As the Cailleach gives death, Brighde gives life. She is midwife, healer, poet, and guardian of the flame. She tends the fires of life, seeing to our health, both physical and spiritual. Imbolc is Brigid’s homecoming because this is the time when everything is pregnant with possibility. The end of winter is finally a dot on the horizon, and we begin to make plans for the growing season ahead. Seeds lying dormant inch closer to germination, pregnant ewes feel lambs quickening in their bellies, and udders begin to swell with milk. The word Imbolc is thought to mean “in the belly”, and Oimelc has been translated to “ewe milk”. It’s for this reason that Imbolc was traditionally celebrated with milky foods. This sweet, fatty, life-giving drink signified the promise of impending births as well as the first hint that the time of hunger and want was coming to an end. Saucers of milk were set out as offerings for Brighde on Imbolc in gratitude for the passing of the harshest part of winter. Cloaks used for healing and comfort were set out overnight in hopes that she’d imbue them with her curative magic. Brigid’s crosses were made and hung in homes, barns, and placed under marriage beds during Imbolc for protection and to promote fertility and safe delivery of babies. These crosses crafted from reeds and rushes also symbolized the sun re-entering the cycle. Corn dollies were dressed up in effigy of Brighde and taken door to door to be blessed with small tokens of appreciation. She was also given a small bed on the hearth, and butter churns were dressed as the goddess in celebration of the milk that now flowed. It’s Brigid who births ideas and dreams into fruition. She is the spark that never fades, even when the world seems cold. On a societal level, I can see how the medicines of Brighde and the Cailleach are called for right now. Both of them bring connections to the sacred feminine aspects, which we are sorely lacking in our dominant culture’s current ways of being. The Cailleach gives death to those things that do not serve us anymore, and Brighde ushers in a new but familiar rhythm to life. 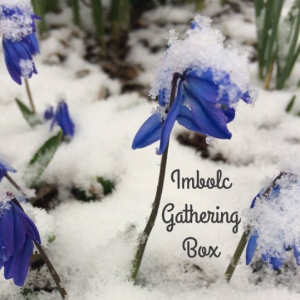 The remedies in this Gathering Box were all formulated to melt, soften, and quicken different aspects of your body in keeping with the theme of Imbolc. I’ve used some warming herbs to stimulate circulation, nervine and adaptogenic herbs to soften the effects of enduring the stresses of winter, bitter herbs to wake up our digestion, and gentle lymphatic herbs to soften and move stagnation. 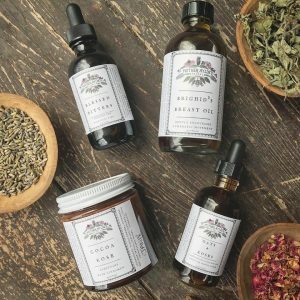 In these formulas, you’ll also find herbs that I felt embody and express the spirit of Brigid, such as dandelion, blessed thistle, violet, rose, cacao, and things to do with milk. 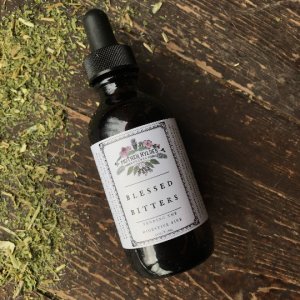 Blessed Bitters- tending the digestive fire. Dandelion root, angelica, blessed thistle, various aromatic mints (peppermint, apple mint), vegetable glycerine, alcohol. I’m sure many of you can relate to being in sympathetic excess like that. It’s easy to say “just make time for yourself”, but it’s not always that easy to stop the ride when school lunches have to be made and schedules have to be kept. Part of self care is of course, knowing what to say no to, and I do practice that, even though the thing or person I’m saying no to doesn’t always understand why (you don’t owe anyone an explanation, by the way). Good sleep hygiene, proper nutrition, spending time outside, and exercise also play a big part in stress management, but herbs can also be a big help. This adaptogenic formula is trophorestorative to the nervous system, can help with brain fog, and is soothing to your emotional heart. 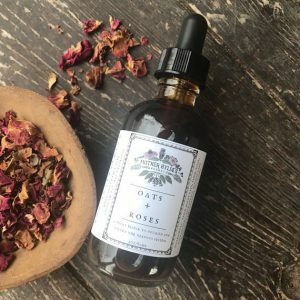 Oats + Roses Elixir- milky oats, ashwagandha, tulsi, rose, honey, alcohol. To nourish and soften an overtaxed, crispy nervous system. Best taken long term. 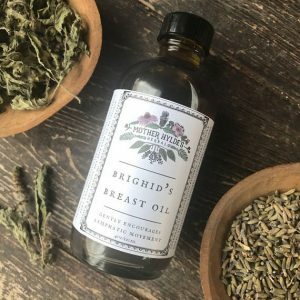 Brigid’s Breast Oil- dandelion, violet, calendula, ginger, lavender, in safflower, sweet almond, and olive oil, lavender + tulsi essential oils. Use this as a weekly/monthly self massage ritual or to help ease the discomfort that sometimes accompanies breastfeeding. Can also be used as a general massage oil for gentle lymphatic movement (you don’t need to be in a body with breasts to benefit from this!). An electuary is powdered herbs mixed into honey for easy consumption. This is basically an instant hot drink mix, although it’s also delicious drizzled over toast or oatmeal. There is no need to refrigerate this because the herbs are dried and the honey is a preservative. 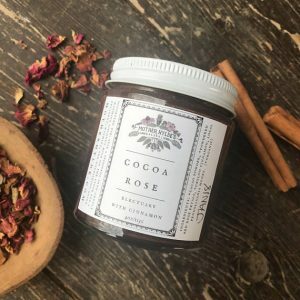 Ingredients: powdered red rose petals, cocoa powder, Ceylon cinnamon powder, local Pennsylvania honey, Himalayan pink salt. All organic herbs. Decadent and warming, especially when prepared in warm milk (full fat coconut is my favorite!) Originally part of my Imbolc Gathering Box, where the theme was melt, soften, quicken. There you have it! My Gathering Boxes are always priced lower than if you were buying the remedies individually (so try to catch the pre-orders! ), but sometimes I have leftovers and they get listed individually in my Etsy apothecary. As many of these things are seasonal, there probably won’t be new batches of these until next year, as I’m already preparing for the next Gathering Box, Ostara. 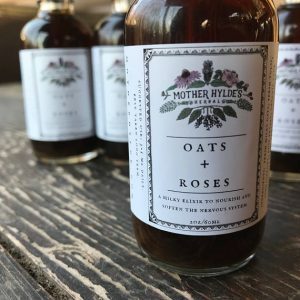 You can follow me on instagram @motherhylde or Mother Hylde’s Herbal on good ol’ Facebook.